Phoenix, Arizona — When Willie and Lynn Itule launched their produce distribution business on Tax Day 1979 they started with an avocado green pick up, some help from friends and a dream of leaving a legacy. Forty years later, the husband and wife team lead an organization based at an 80,000 square foot state-of-the-art warehouse in West Phoenix that has grown to more than 100 employees including their three children: Billy, Andy, and Jessie. “My dad would be proud. Looking around at the facility, the people and the family that are here — he’d be proud of all of us.” said Willie of his father — also Willie, who passed away in 1979. 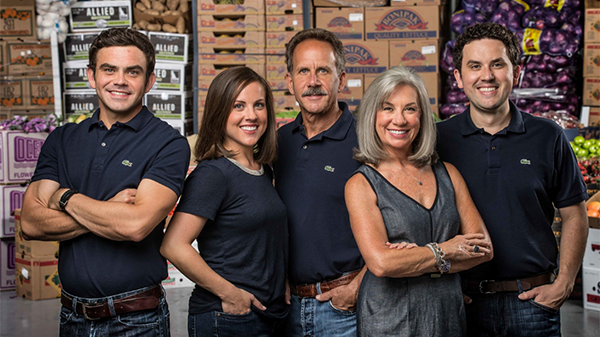 The senior Willie had a produce company of his own based in the historic “‘Duce” section of Phoenix, just east of what is now Chase Field, and it served as the inspiration for the business Willie and Lynn chose to pursue. Willie and Lynn have put family at the center of their successful Arizona business over the decades. Today, each of their three children have scoped a role that suits their talents and has helped the business grow with Billy leading sales and business operations, Andy involved with fleet and warehouse management and Jessie managing finance. The mentality of family stretches beyond Willie and Lynn’s children, to employees and customers who have been with Willie Itule for nearly as long as the company has been around. Lynn and Willie don’t see that attitude changing as they prepare for their fifth decade of operations, but other changes are on the table as their business evolves. The most significant sign of transformation happened in 2016 when Willie Itule Produce moved to their current warehouse in West Phoenix from their long-time location on Jackson Street. By 2015, the footprint of the Jackson Street warehouses could no longer scale with the growth of the business itself. In the years leading up to the produce company’s move, two trends were influencing growth: the partnership of buying groups brought added opportunity for corporate business, the restaurant landscape of Phoenix continued to thrive. With all these factors at play, Willie, Lynn, and their three kids decided it was time to move operations. This new space — an 80,000 square foot facility near 43rd Avenue and Van Buren — opened up a radically new chapter for Willie Itule Produce, ushering in prospering relationships and a fresh take on technology. In the last two years, the Willie Itule Produce team has overhauled their technology infrastructure at nearly every touchpoint in the business. The future of Willie Itule Produce is likely to focus as much on fresh thinking and digital innovation as it does on fresh produce.